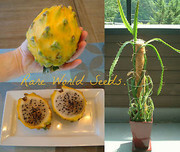 JUST IN Giant yellow Peruvian Dragon Fruit Seeds. These seeds were removed from fruit just 48 hrs ago. This is the rarest df seed available only from Peru. Not to be confused with the tiny Colombiana. This fruit is XL and round. Seeds are the largest df seeds you will ever see. The fruit is as sweet as agave nectar and very appealing weighing in at 1lb or more. Pretty impressive for yellow df. Get yours now as these always sell out when I get them. local pick up in Central Florida also available. Please be sure to include shipping address. Having trouble uploading pics from my phone. I can text anyone pics of fruit and seeds just let me know. Hey Mike. Don't worry I do international shipping. I have shipped to Africe, Europe, Hawaii, The Carribbean, etc. So Greece is no problem. $14.00 for 12 seeds shipped internationally. Thanks again. All of today's orders will be shipped out tomorrow morning @ 9am Thank you. ALL orders shipped out this morning. Seeds still available. Happy Thanksgiving to all. Seeds arrived today . Thanks for the extras Carlos! This weekends orders will be shipped Monday morning, November 27th, 2017. Yes. The fruit are much larger and sweeter than any other yellow I have tasted. What is the correct name for this yellow dragon fruit? I have seen both Selenicereus megalanthus and Hylocereus megalanthus for yellow dragon fruit. I believe they changed it from S Megalanthus to H Megalanthus. Please correct me if I’m wrong. Fresh seeds still available. No cuttings at this time. All orders have been mailed out should receive by Monday. I'm interested, but pics would be nice.